FC Barcelona Lassa 4-3 Jaén: Cup champions! All that hard work paid off in the end. 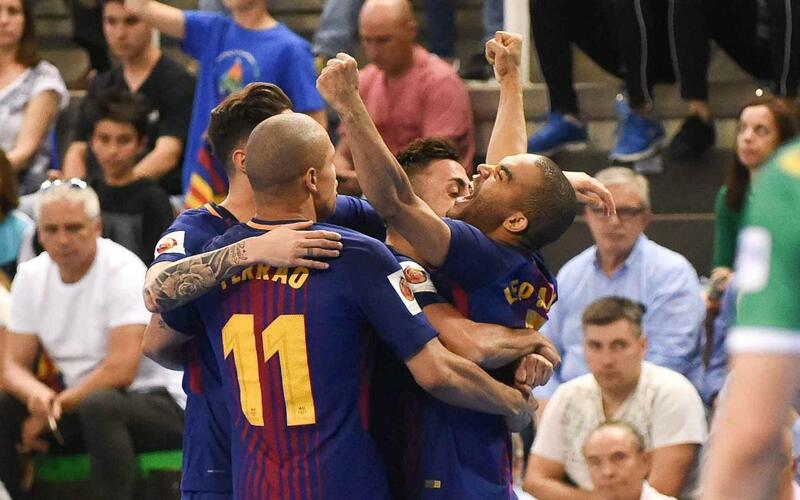 FC Barcelona Lassa’s futsal team have ended their trophy drought and collected the first piece of silverware of the Plaza era. The Copa del Rey is ours after a final against Jaén that went right down to the wire in Cáceres. Aicardo finally tipped the balance Barça’s way with a powerful finish two minutes from the end of the second period of overtime. It had been a gripping game, with Ferrao and Esquerdinha scoring early but regular time eventually ending with the sides locked on three goals each – all the goals coming in the first 19 minutes of play. The rest of the game panned out with no further score, and the scoreboard didn’t budge for the best part of two periods of additional time either. Tension mounted to fever pitch – and then up stepped Aicardo with a strike that will go down in section history. That’s the fifth time that the Catalans have won this trophy, and after the long wait, it comes as sweet moment for a team that has been the unfortunate nearly-men just too many times of late. Barça Lassa: Paco Sedano, Aicardo, Lozano, Ferrao, Joselito –starting five- Joselito, Esquerdinha, Joao, Adolfo, Dyego, Rivillos. Jaén: Didac Plana, Mauricio, Boyis, Alan Brandi, Chino –starting five- Burrito, Campoy, Carlitos, Dani Martín, Víctor Montes. Goals: 1-0, Ferrao (min 5). 2-0, Esquerdinha (min 6), 2-1, Burrito (min 6). 3-1, Léo Santana (min 13). 3-2, Alan Brandi (min 16). 3-3, Dani Martín (min 19). 4-3, Aicardo (min 44).